The Loggia dei Lanzi is an open hall in Florence on the central square Piazza della Signoria. The building dates back to the 14th century. Today there are statues in the hall, some of them are well known. 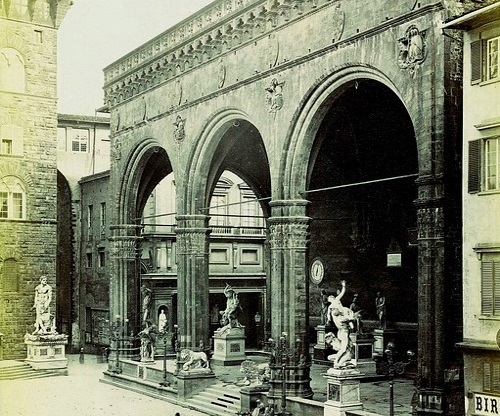 The Loggia dei Lanzi served as a model for the Feldherrnhalle in Munich. It’s an open hall you can walk into. You go up a small staircase between 2 impressive lions. The Loggia dei Lanzi was built between 1376 and 1382 by Benci di Cione and Simone di Francesco Talenti. The famous Uffizi Museum is right next door. More rarely is the Loggia dei Lanzi also called Loggia della Signoria. On the Loggia dei Lanzi the statues stand in 3 rows. In the first row are the two lions and right and left each a very well-known statue. In the middle row there are 3 sculptures, 6 more behind the back wall. First row: Much admired by the many tourists in Florence, also the two Medici lions at the entrance to the Loggia dei Lanzi receive on the 16th century. Between the two predators is the staircase that leads to the loggia. 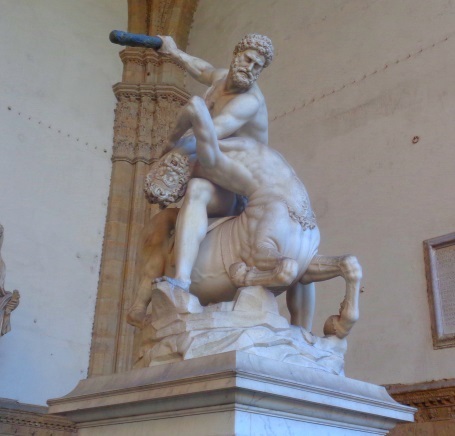 The Perseus sculpture in the loggia with the Italian name „Perseo con la testa di Medusa“ is considered one of the greatest works of Mannerism, an art style of the late Renaissance. The work is by Benvenuto Cellini (late 16th century). 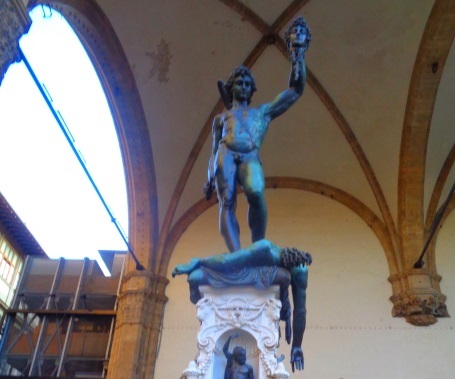 Perseus is perhaps the most famous work of art on the Loggia dei Lanzi Florence and stands in the first row on the left. The sculpture is made of bronze, unlike the other stone statues. 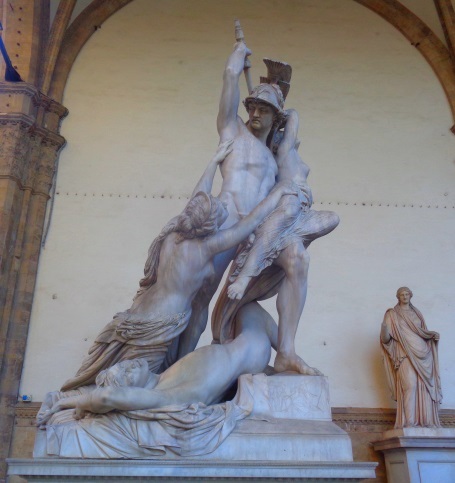 Very famous in the Loggia dei Lanzi in Florence is also a statue of Giovanni da Bologna called „The Robbery of the Sabine Women“ from the late 16th century (1st row far right, picture below). The one in the middle row in the middle stands the statue „Menelaus holds the body of Patroclus“, an ancient Roman statue. Third row: On the back wall of the open hall Loggia dei Lanzi Florence there are 6 old Roman statues. These are less known than the other sculptures. The Reanissance was the art epoch of the return to antiquity, old Roman statues were extremely important in this period. The open arcade building of the Loggia dei Lanzi later had many fans among them, for example Michelangelo. The Feldherrnhalle in Munich is almost a replica of the building in Florence. When we visited the Loggia dei Lanzi one afternoon in winter, access to the Loggia dei Lanzi Firenze was not restricted. However, according to some literature sources, this is now different in summer. Only a certain number of visitors should be allowed into the hall. But as far as we know there are no opening hours, entrance fees or similar in the Loggia dei Lanzi. The loggia was built in the Gothic style and initially served as a meeting place for the citizens of Florence. The 3 large arches and some other arches date back to the 16th century, to the Renaissance. Lanzi is a short form of the Italian word for land servant. Where’s the Loggia dei Lanzi? The Loggia dei Lanzi is on the centre square of Florence Piazza della Signoria. Also the old power center of Florence, the Palazzo Vecchio, is on this square. In front of the entrance to this palace, less than 50 metres from the Loggia dei Lanzi, stands the David by Michelangelo, the most famous sculpture in the world. This is also a copy, but this is where Michelangelo’s David originally really stood. 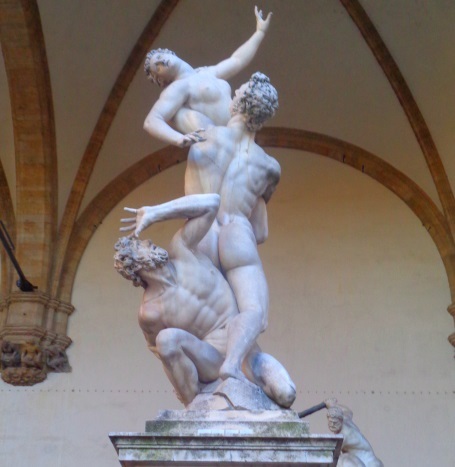 For safety reasons, the original was brought to the Accademia Florence Museum, about 1 kilometre away.